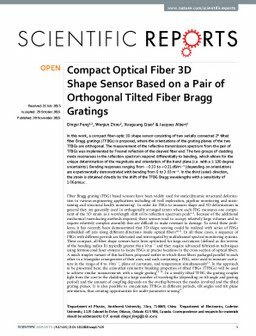 In this work, a compact fiber-optic 3D shape sensor consisting of two serially connected 2° tilted fiber Bragg gratings (TFBGs) is proposed, where the orientations of the grating planes of the two TFBGs are orthogonal. The measurement of the reflective transmission spectrum from the pair of TFBGs was implemented by Fresnel reflection of the cleaved fiber end. The two groups of cladding mode resonances in the reflection spectrum respond differentially to bending, which allows for the unique determination of the magnitude and orientation of the bend plane (i.e. with a ± 180 degree uncertainty). Bending responses ranging from -0.33 to + 0.21 dB/m -1 (depending on orientation) are experimentally demonstrated with bending from 0 to 3.03 m -1. In the third (axial) direction, the strain is obtained directly by the shift of the TFBG Bragg wavelengths with a sensitivity of 1.06 pm/με.